The city of Bologna, the capital of the Italian province of Emilia-Romagna, has a rich fencing pedigree, stretching from the 14th to 19th centuries. One of the most famous traditions to come from this central Italian city was the fencing school founded in 1415 by Lippo Bartolomeo Dardi, a swordsman, astronomer and professor of mathematics at the University of Bologna, just years after dei Liberi composed his il Fior di Battaglia. Although tradition ascribes a book to Dardi, no such manuscript has ever been found, and the exact form of the art as taught by its founder remains unknown. Our primary sources for this style are five works from the 16th Century: Antonio Manciolino (Opera Nova, 1531), Achille Marozzo (Opera Nova, 1536), Angelo Viggiani (Lo Schermo, written circa 1550, published posthumously in 1575) and Giovanni dall’Agocchie (Dell’arte di Scrimia, 1575). Most recently, an extensive, yet incomplete and anonymous manuscript (c.1550) was found in the city of Ravenna, and provides a great deal of clarification and explanation on the tradition’s theoretical framework. All of these texts share a consistency of terminology and curriculum that is traced to the most famed teacher of the tradition, Guido Antonio de Luca, who flourished in the city around 1500 and “from whose school came more warriors than from the belly of the Trojan horse”, including Antonio Manciolino and Achille Marozzo, and the famed condottiero, Giovanni de Medici. 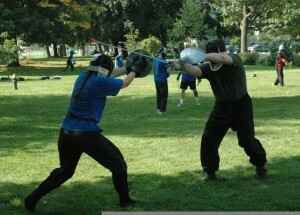 The Bolognese masters have also left behind a very specific didactical method, including long solo-drills, like those of Okinawan kata or Chinese kung fu forms, assalti (sequences of techniques to be used in friendly matches) and abbattimenti (techniques to be used in serious duels). In all, the Bolognese style is extremely dynamic and flamboyant, with its many guards, varied footwork and creative attacks. The Dardi School forms both a chronological and technical “bridge” in the Guild between the medieval and rapier curriculums. Guild members are first exposed to the school in the Scholar grade, where the work of Angelo Viggiani, and to a lesser extent, both Manciolino and dall’Agocchie, help form the technical core of the basic arming sword curriculum. Free Scholars will also study the sword used in conjunction with companion arms, such as the buckler, primarily based on Manciolino, Marozzo and the Anonymous Bolognese. The treatises of the Dardi School also form an important source for CSG polearm instruction. Stephen Fratus’ translation of an Anonymous Manuscript(c.1550) that covers a wide variety of weapons and gives a clear discussion of theory. Jherek Swanger’s translation of Book Three of Viggiani’s Lo Schermo. Using Viggiani’s Perfect Schermo as a Bolognese Fencing Primer. Biographies of the Bolognese masters. 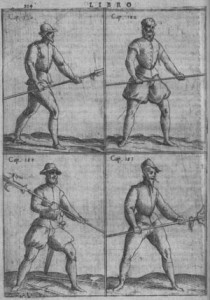 The Bolognese Swordsmanship web page at the The Order of the Seven Hearts. Highly recommended! 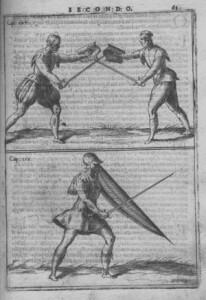 Tom Leoni provides a wide variety of detailed source material, including a photo essay on the many sword and buckler guards of the Bolognese school and a short solo-form for the sword-alone by Givovanni dall’Agocchie, and several essays on general rules and advice on fencing with the sword and the sword and dagger, also taken from dall’Agocchie’s treatise. 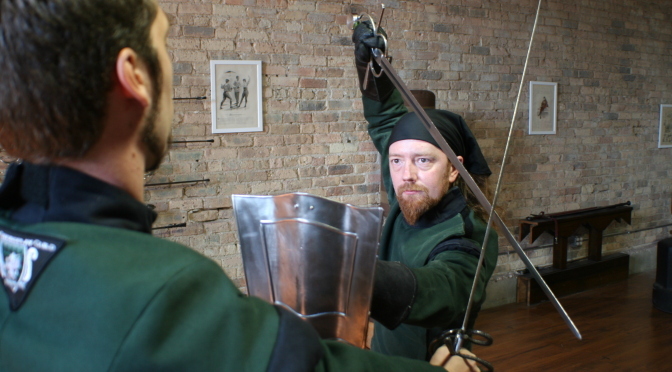 An analysis of Marozzo’s first assault, part one with the sword and buckler. An analysis of Marozzo’s coda longa series of guards. The Giovanni dall’Aggochie discussion group on Facebook is a great place to meet other students of the tradition, ask questions and get help!